It’s a Wonderful Watery World: Explore IT! What is something precious, free and abundant? It is something that is all around us. Something we use every day and it is very old. We can’t make this or find any new—what we have is what was here on Earth when dinosaurs roamed. It is up to us to preserve and conserve it! It is…WATER! Water is our most prized resource precisely because it is so valuable and so necessary. In order that the water that we have remains high in quality and does not become depleted, we must make sure that this closed system remains diverse, undamaged and productive. Wise use, conservation and recycling of water is our best offense and who better to be good stewards than our children? If children explore and come to know about water and understand it, they will naturally want to take care of it. 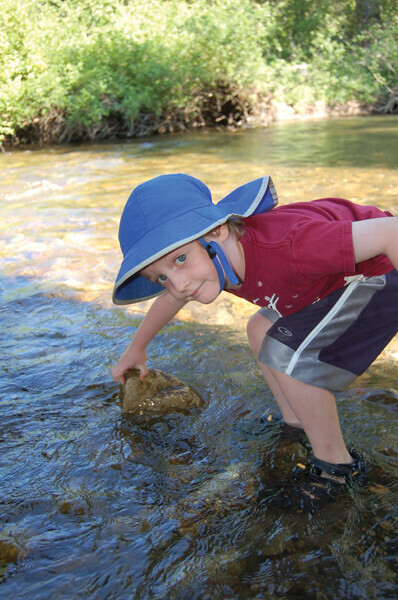 Water is the perfect thing to explore with children, in your home and backyard! It is clean, non-toxic and readily available. Children can learn about water as a form of matter, how it is used and how to conserve this precious resource through playing with it. There are many good nonfiction books on water. “Water” by Emily Neye or “All the Water in the World” by George Ella Lyon and Katherine Tillotson are good examples and great places to start inquiring. Bath time or while doing dishes is an ideal place to explore. Using common objects like plastic containers, explore how water moves and has no shape of its own, but takes the shape of the container it occupies. Use words like flows, drizzles, pours, drips, pools, rains, leaks, streams, dribbles, gushes, sits and runs to emphasize the different ways in which water moves. Explore! With an adult, experience how water can be both ice and water, and also a gas/vapor. What causes water to be different forms of matter? Temperature! How does temperature impact water outside during different times of the year here? Read “A Drop of Water” by Walter Wick and then explore! Children can appreciate how special water is and how important it is for life by looking at a globe and noticing how much of our Earth is water as opposed to land. Spin the globe and let your child’s finger land on water or land and keep track. Water is 70% + of the globe. Explore how water is present in things around us—apples, our bodies, trees, rocks, etc. We are mostly water! Blood and sap are mostly water! For older children, they can learn about the chemical properties of water--Hydrogen and oxygen—H2O or HOH. For younger children, explore bubbles and ice and do simple float and sink explorations. The bathtub is an ideal place for trying fruits, vegetables and other objects from nature. Try pinecones, rocks and leaves and other things you find outside. Go on a nature walk to find water in our surroundings. Can we always see the water? Can it be in the sky, underground, or in other matter? Explore by pressing the ground with paper to try to find water in nature—in soil under tree, our foreheads, grass…and where might it be at other times of the day and/or year. Explore the difference between fresh water and salt water by filling a bowl or bucket with salt and explain how important fresh water is for our survival, but that over 96% of Earth’s water is salt water. Brainstorm other places that hold water—glaciers, groundwater, clouds, rivers, lakes, air, etc. Fresh water makes up only 2.5 % of the Earth’s water and most of that is in groundwater or ice. A really fun activity is to try moving water through different kinds of matter—sand, soil, clay in coffee filters and note how some materials allow the water to move quickly and others seem to hold it. Water runs right through sand but pools in clay. Read “Water Cycle” by Christina Wilsdon and brainstorm water words beginning with hydro (hydrology, hydrant, hydrological), and explore the “tions” that make up the water cycle—evaporation, condensation, infiltration, precipitation, percolation, etc. Challenge words: sublimation, evapotransporation. Draw the watercycle as a circle to reinforce that water is a closed, recycling system. “Magic School Bus—Wet All Over” is a good book to engage young learners about the watercycle. Explore what lives in a watery world—small and large. Use viewers like magnifying glasses to see closer. 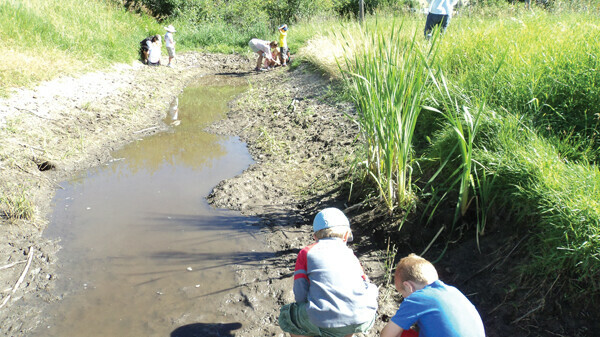 Read “The Pond” by Maud King and use a net to find things like algae and macroinvertebrates. Visit a local pond and sketch what you see. Guess where the water came from and how the pond was made. Did it become a pond through natural means or was it created by people? Draw a map that includes landforms, plants, animals and buildings. Does the pond change by season? Make a rain gauge from a liter pop bottle (cut off the base for an opening and prop against something outside with the neck end down) and observe how much water comes to us from rain. How do we use water currently and how can we use it more wisely? Take a field trip around your house and identify everywhere that water is used and how it is used. Sink—drinks, washing hands, dishwashing. Washing machine—cleans clothes. Do the same outside. Think of ways in which we can conserve water and recycle water. Make posters of how to save or use water wisely. Read “Water Dance” by Thomas Locker to see the beauty of water in our world. Using a spray bottle as a water source, watercolor inside and outside. There’s a reason that it is called WATERcolor! Paint water recreation scenes and make travel posters to watery places. Explore the water available when you go different places. Kids love a scavenger hunt, so look for water in ingredient labels at the grocery store. Look for how water is used at other places you go in the community. By engaging children in activities that help them learn about water, they will come to know this cherished resource and understand it, thus becoming better stewards and adding to our ability to sustain a resource we cannot live without. Kristy Michael is on the MOSS (Montana Outdoor Science School) Board of Directors and invites everyone to the Fish Technology Center on Saturday, June 6 for the 17th annual Watershed Festival and Fishing Derby. This free, family friendly community event celebrates water and our local watershed through educational stations, children’s activities and exhibits.